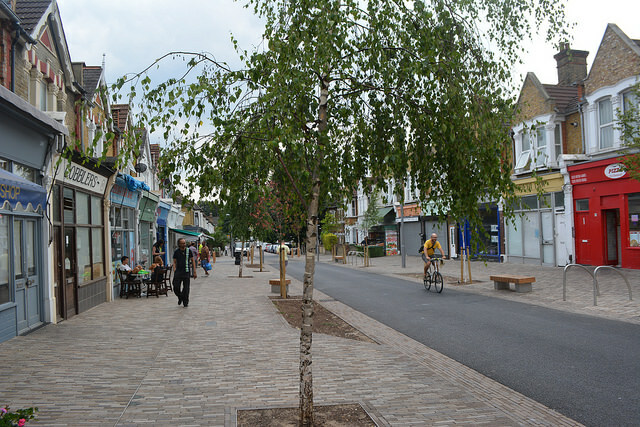 What does it look like when you create a more liveable neighbourhood? What does that change look like on the ground, and how do you get the local community behind the change? These were some of the questions we were hoping to answer from our visit to the Waltham Forest Mini-Holland scheme earlier this month. 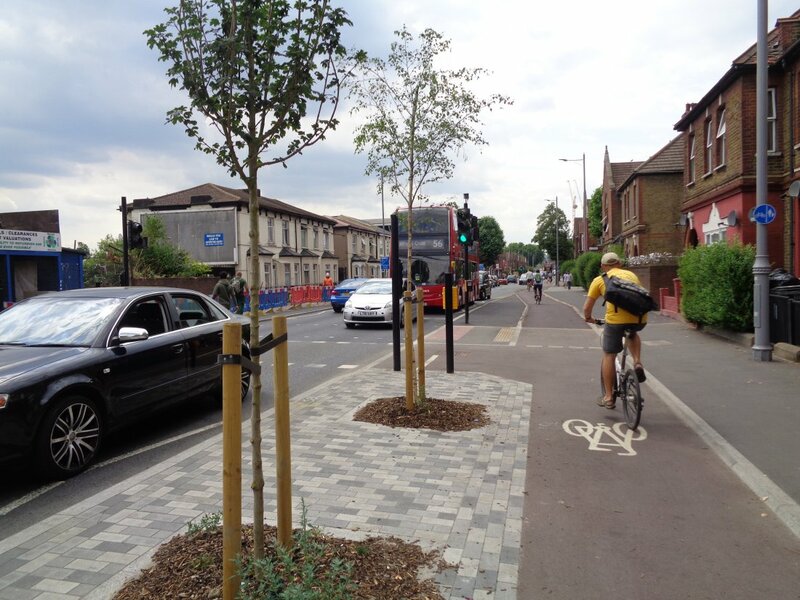 Although the £30m funding for the scheme came from a desire to make the roads safer for cycling, it was made clear that for the scheme to be a success it had to be about making the town a better place for everyone. 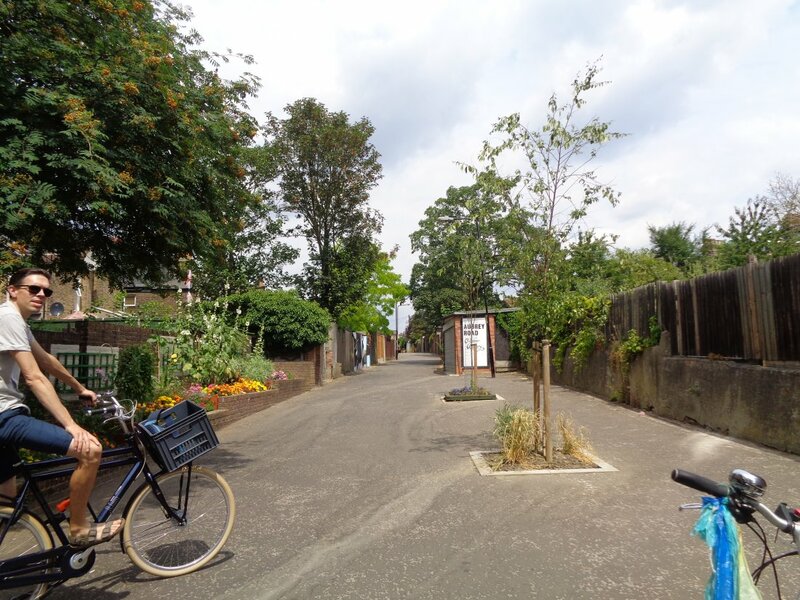 One of the first places we were shown was a former rat-run which is now filtered using bollards at one end of the street making it a quiet route for walking and cycling, and even a place where children feel safe enough to draw chalk pictures on the street. People can still access their garages by car, but with no through traffic this has been transformed into a delightful place to be. Residents now have a pride in the area and have taken over looking after the newly planted flower beds. 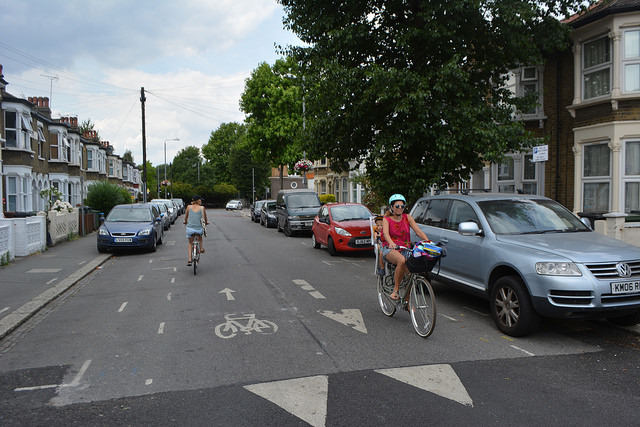 We saw plenty of “legacy” cycle infrastructure, some from over 20 years ago – some good, and some the more familiar white line on the pavement. We rode through an underpass under the north circular which was infinitely more pleasant than battling with the cars on the junction above. Something like this is sorely needed when crossing the A264 north of Horsham. 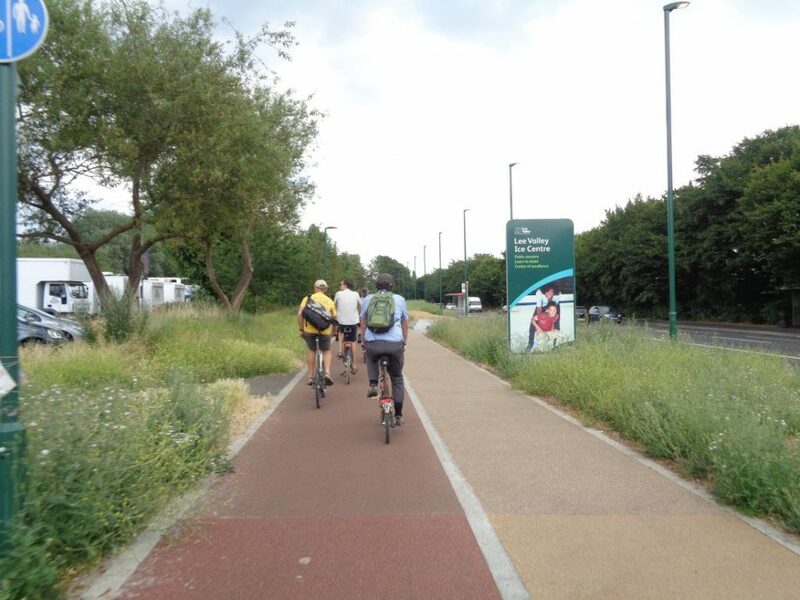 We rode for miles on a new main cycle route (not part of the Mini-Holland bid but incorporating some of the design principles) with stepped – or “hybrid” – tracks alongside the road. Although the continuity of the route was impressive there was a bewildering variety of widths, heights and side entrance treatments. The ride quality varied – some felt good, in other places it was essentially still only a shared-use pavement. It was already recognised that this will need to be improved, which highlights the fact that it is better – and cheaper in the long run – to build it right in the first place. Lots of residential roads had modal filters, in quite a variety of designs. Some had large flower boxes across the road leaving a gap for cycles. Others had tables, build-outs or simple bollards. All this made the roads noticeably less busy, quieter and less stressful to ride on. 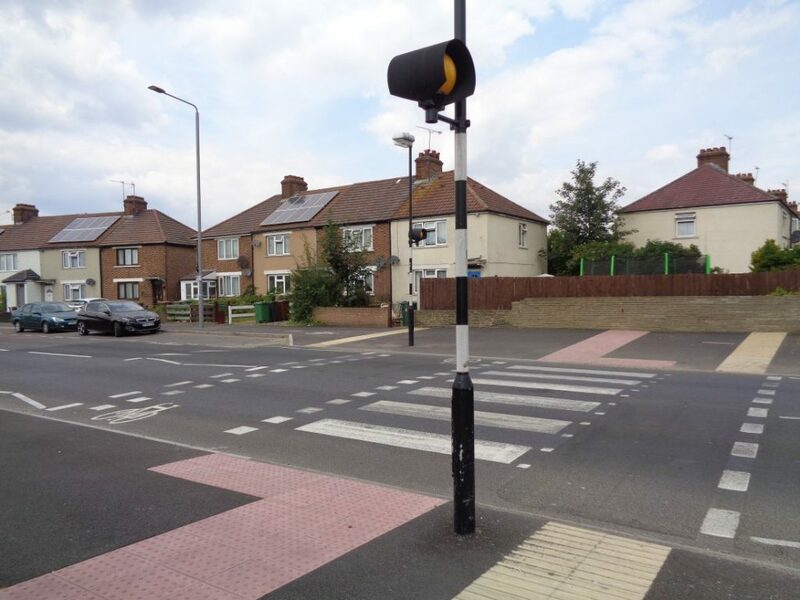 We saw several example of the “tiger” crossing (combined uncontrolled zebra and cycle crossing) which work very well. We were shown an example of simple traffic calming outside a primary school which had created a much pleasanter space for everyone. The road used to have over 1500 vehicles per day going past the school but with area-wide modal filtering this has reduced to less than 250. As a consequence the road now felt very gentle and safe, as appropriate to a road outside a school. The kerb has been realigned to give more space for the new school site and much-needed greenery had been added, incorporating a SuDS (Sustainable Drainage Scheme) for managing rainwater. Cycle parking has not been forgotten. 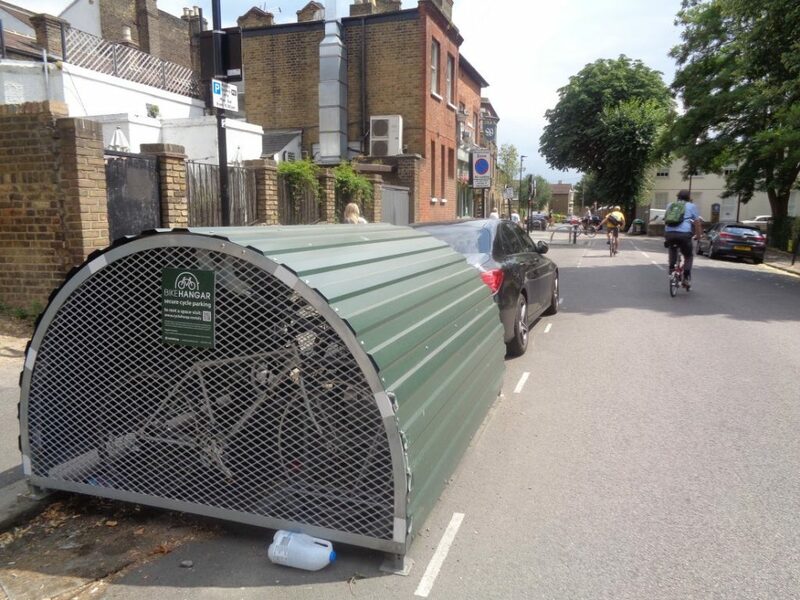 Attractive cycle parking “hubs” have been provided at the railway stations, and bike hangers (which can store up to six bikes in the space taken by one car) have been located in many residential streets. 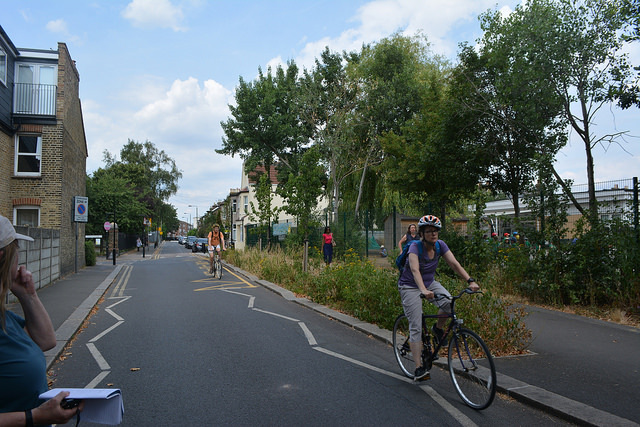 Along Lea Bridge Road we rode on a fully-segregated “cycle superhighway” which travels east-west across the borough and which when finished will run for 4km. 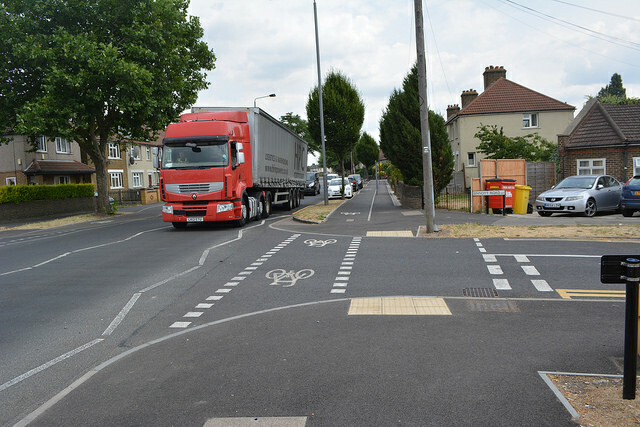 Despite this being a busy road we were entirely protected from the heavy lorries and could stop and talk easily. The bridge over the railway was a former traffic bottleneck but a new cantilever extension allows for a 4m wide cycle path on both sides. This is really impressive and show what can be achieved when a scheme is properly funded. Even though the route is only half complete, you can already see increasing numbers of ordinary people cycling. The path continues west towards Hackney. Here we could truly be in Holland! 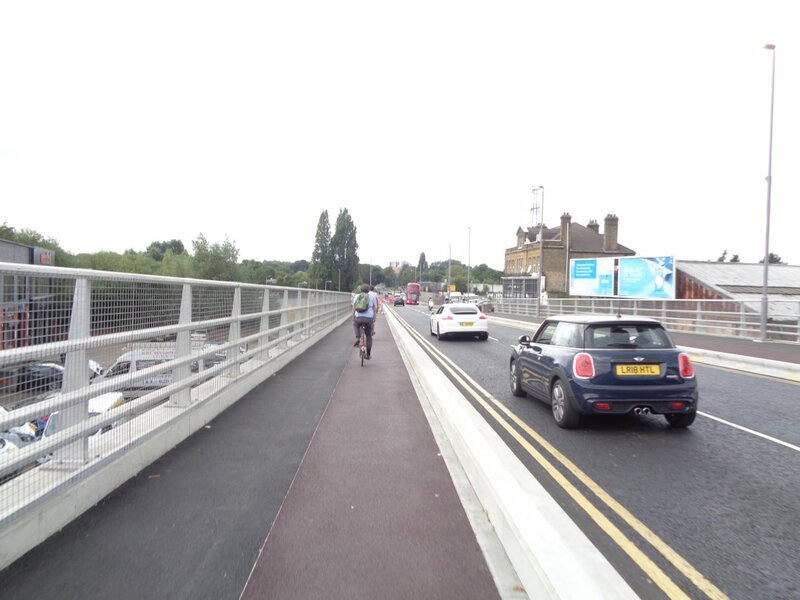 Lea Bridge Road cycleway – truly Dutch! We were shown Francis Road which has been given the low traffic neighbourhood treatment and is very pleasant and quiet as a result. Cars are allowed at certain times only: infringements are monitored by ANPR and drivers are sent a fine in the post. 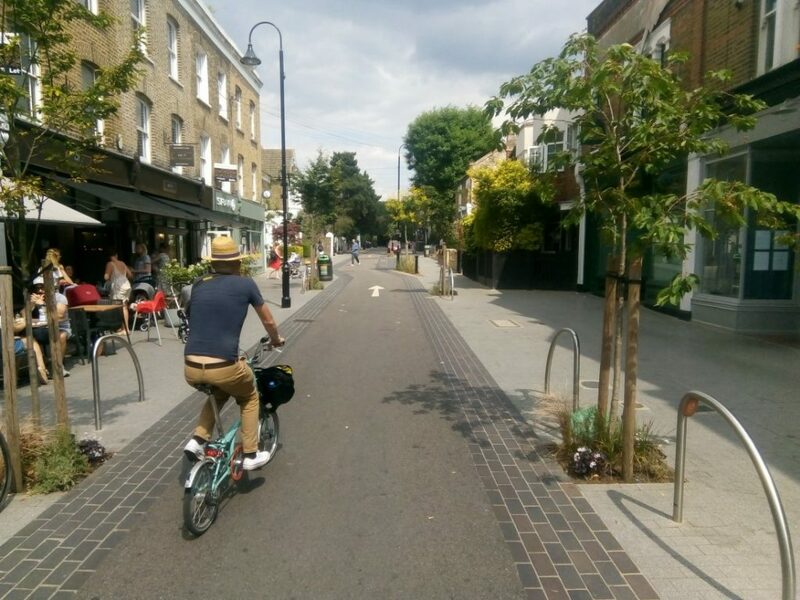 The last stop on our tour was the recently pedestrianised Orford Road, the jewel in the crown of the scheme. The transformation of this area was striking. What was once a dead space used as a car park is now a truly attractive destination for people. 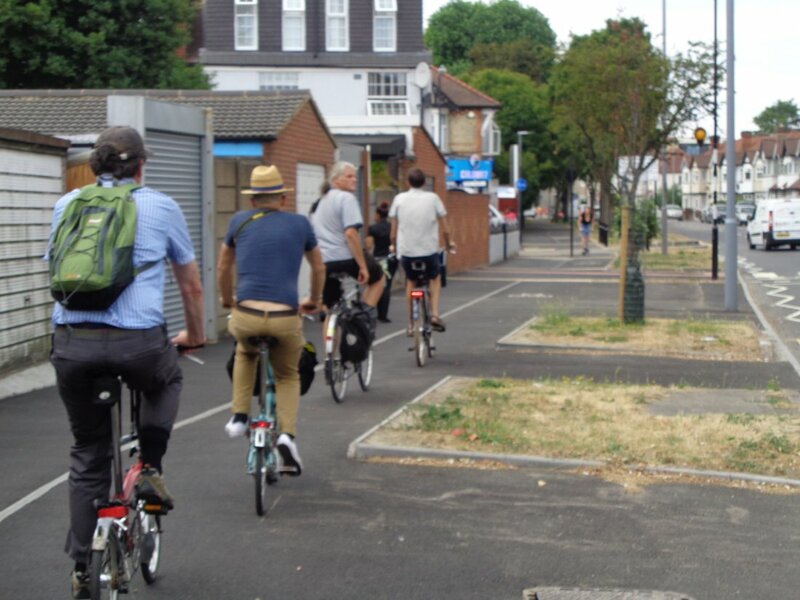 Recent research has shown that the Mini-Holland schemes have, not surprisingly, boosted the numbers of people cycling but the increase in people walking is actually greater in absolute terms than the increase in cycling. Good schemes benefit everyone. We are indebted to Paul Gasson and Dan Kelly for showing us first-hand the transformation brought about by the Mini-Holland scheme. 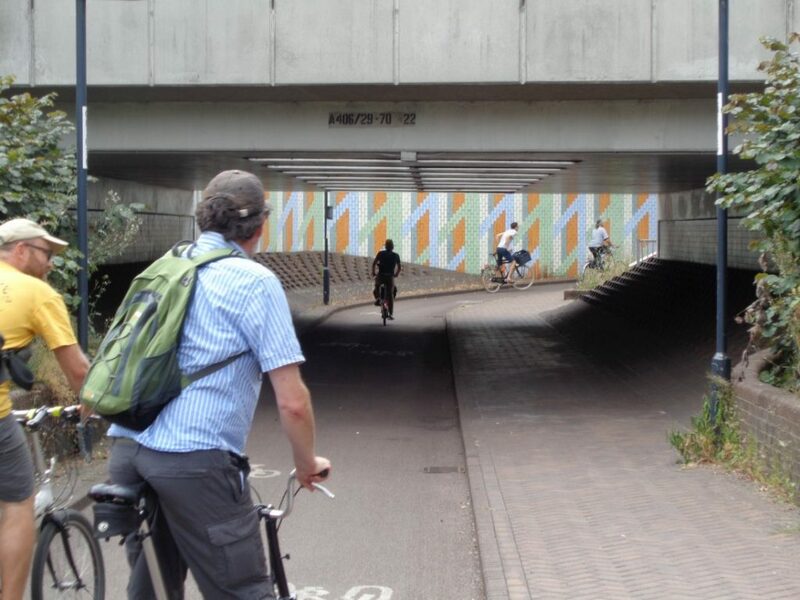 They have given tours to over 40 groups – mostly town planners and councillors from all over the country – who have been keen to see for themselves the benefits to the whole community, not just cyclists, of “going Dutch”. That’s a fascinating report. One thing that strikes me is how ‘ordinary’ so many of those streets are, and they have managed to make them attractive and safe for biking and walking. There are streets like Lee Bridge Road in almost every town in the country. Is one of the key points here that not every street is jammed full of parked cars? There is clearly parking available, but it’s not been allowed to dominate in the way it is so often elsewhere. Now to get a mini Holland in Horsham!